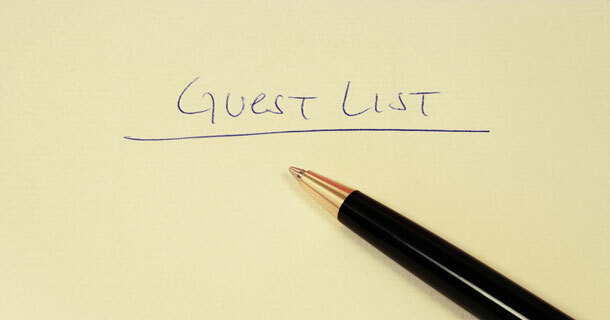 Is It Ever 'Okay' To Leave A Close Relative Off The Guest List? You are here \ South Africa Weddings \ Tie The Knot \ Wedding Tips & Advice \ Is It Ever ‘Okay’ To Leave A Close Relative Off The Guest List? It’s one thing trimming down the size of your wedding guest list. But when you leave off a close family member – like your stepsister, first cousin or mother – it’s another issue entirely. Or is it? Can one legitimately leave someone close to one, for whatever reason, off the guest list and get away with it? Granted third cousins once removed and uncles and aunts you’ve never met, and who live in another country anyway, hardly warrant an invitation. But chances are you’ll invite them anyway, on the understanding that they won’t come. But what if you have had a major fall out with your sister, or even your mother? Do you disregard them and deliberately leave them out of one of the most important events of your life, or do you treat it as a means to smooth over ruffled feathers and mend the gaping divide? Before you launch in there with the self-righteous standard – ‘but it’s MY day and I invite who I want to my wedding‘ – I’m going to intervene and remind you of something. Whilst you have every right to do as you please, and you should never be bullied into inviting someone, it is prudent to reflect that we live in a society where justification for what would formerly have qualified as just plain bad manners is par for the course and is actively encouraged – celebrities get away with appalling behaviour on a daily basis, which instead of receiving ostracism gets newspaper miles instead. By inviting your mother / sister / cousin with whom you’ve had a fall out you gain the moral upperhand and will, in years to come, be relieved of the guilt and pain you would suffer each time you hauled out the wedding photographs only to be reminded very sharply of their absence. If the animosity is such that they cannot face coming to the wedding, at least do the right thing and invite them. Leave the decline of the invitation up to them or you fuel their self-satisfaction and give them the upper hand. You also rest easy knowing that you have done the ‘right thing’ at a time when wisdom is so seldom put into action.